Here are two dominant companies and an index fund that every beginning investor should consider for his or her portfolio. If you're just getting started as an investor, congratulations! You're taking an important step that will almost certainly pay off over the long term, helping you build wealth to improve your family's life. But it can also be a foreboding experience, and there's a lot to learn. In its purest form, investing is all about finding the right companies, buying a piece of them at a reasonable price, and then holding them for as long as possible while the company does all the work. And while that may seem simple -- and in many ways it is -- it's not always easy to know where to begin. We asked three of our contributors to write about a stock they think is ideal for investing rookies, and they gave us two well-known, dominant companies in Wal-Mart Stores Inc. (NYSE:WMT) and Walt Disney Co. (NYSE:DIS) and a low-cost index fund that is made up of more than 3,000 companies, the Vanguard Total Stock Market ETF (NYSEMKT:VTI). If you're still trying to get your investing legs underneath you, these three stocks are work a close look. Keep reading to learn why we think they're excellent starter stocks for new investors like you. Chuck Saletta (Wal-Mart Stores Inc.): Retail titan Wal-Mart may not immediately come to mind when you're thinking of family-owned businesses, but the Walton family controls about half its shares. In the rapidly changing world of modern retail, that family control can actually be a good thing, as it means the company doesn't have to answer to the short-term whims of Wall Street. Instead, management can focus on making solid long-term investments to help the company thrive for a long time to come. That opportunity for long-term focus as well as Wal-Mart's solid financial position and reasonable valuation make it a great stock for beginning investors to consider buying. It reported over $6.8 billion in cash and equivalents on its balance sheet in its most recent annual report filing. In addition, its debt-to-equity ratio is around 0.6, indicating that Wal-Mart hasn't overextended itself in its search for growth. What Wal-Mart has done in that regard is to make acquisitions like online start-up retailer Jet.com, enabling it to accelerate its steps to remain relevant in the era of online shopping. It has also tried new store formats, though some -- like its tiny Wal-Mart Express format -- haven't necessarily work out as hoped. Trading at around 16 times both past earnings and forward-looking earnings estimates, Wal-Mart won't set the world on fire, but it won't simply fade away either. With an average of around 4.2% earnings growth anticipated annually over the next five years, along with a dividend yield of around 2.8%, investors can modest returns, without exposing themselves to a ton of risk. That balance makes the company a great first stock for new investors. Seth McNew (Walt Disney Co.): For investors just starting out, there's no need to dig deep into the financials of companies you've never heard of to find great long-term investments. Disney is a great stock for investing rookies because the well-known company has an easy-to-understand business with success across multiple industries. For new investors, it's also easy to see what long-term growth drivers are likely to push its stock higher. The four parts of Disney's business are cable networks, theme parks, studio entertainment (i.e., film studios), and consumer products. Disney's stock was pushed lower in 2015 and 2016 as analysts worried about the pressure ESPN, Disney's largest cable network, had been facing amid a changing consumer environment that favored cord-cutting and skinny cable packages without sports included. But over the past year, Disney has demonstrated its ability to offer its cable network programming through streaming devices. That, plus excitement about the new theme park opened in China last year, a hugely successful year of movie releases, and a growing consumer products and licensing segment have pushed Disney Stock up roughly 14% over the past year. Disney is firing on all cylinders right now, and analysts expect its earnings per share to continue to grow at around 10% in each of the next five years. For these and many other reasons, it looks like a great buy-and-hold stock for investors who want to learn more about picking great companies for long-term growth. Jason Hall (Vanguard Total Stock Market ETF): I'm a firm believer that individual investors can beat the market. But it takes a lot of discipline, experience, and temperament that beginners, frankly, just don't have. For this reason, a low-cost index fund, such as the Vanguard Total Stock Market ETF, is an excellent way for new investors to get invested in the stock market as early as possible while they build up the knowledge and experience to be successful at picking individual stocks. VTI Total Return Price data by YCharts. And with an expense ratio of 0.05% -- that's $0.05 per year for every $100 invested in the fund -- it's a low-cost way to get nearly market-average returns. For beginning investors, it's not a bad idea to invest a portion of your portfolio in this fund, at least early in your investing career. Not only will this keep you invested while you become a better investor, but it could also mean you have a bigger portfolio to invest in individual stocks down the road. 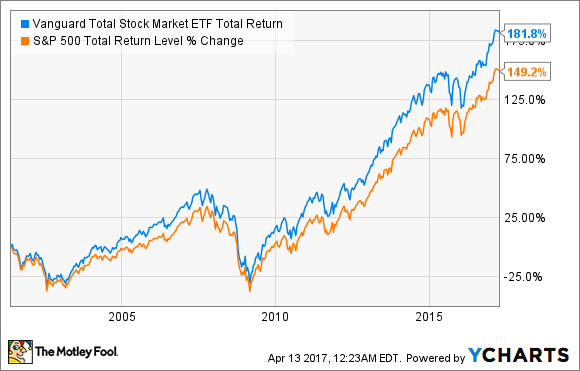 Editor's note: an earlier version of this article misstated the Vanguard Total Stock Market ETF's expense ratio in dollar terms. It has been updated.